Edited by: Völkerkundemuseum Wuppertal. With contributions by: Heinz Jockers, Beate Ostermann. The artist Rüdiger Bergmann prefers sand as material for his paintings: sand gathered on his journeys to Africa and quartz sand dyed with pigments or oxides before it is applied with brush and palette knife on canvas. It is on his various journeys to Africa, South America and Oceania that the artist finds inspiration and fresh impulses for his creative work. In 1995 and 1997 he visited West Africa and chronicled in his art his impressions of the cultures and mythologies of the people he encountered. In his interpretation of motives of the “Dogon mythology”, for instance, they are realised in strong relief or reduced to abstract coloured rectangles. These monochrome paintings of russet or ultramarine sand thus exude an almost serene and meditative calmness. 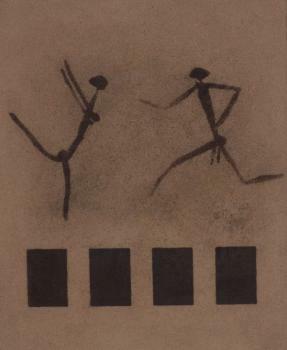 In August 1999, Rüdiger Bergmann visited Namibia and studied several examples of prehistoric rock paintings on site, especially the so-called “White Lady". He returned from his voyage with 38 samples of different sand, which he used to realise his own artistic response to these ancient paintings. These “rock paintings” were the main focus of the exhibition Die weiße Dame vom Brandberg. White Lady in Coloured Sand – Sandbilder aus Namibia von Rüdiger Bergmann, which took place at the Völkerkundemuseum Wuppertal from 21.11.1999 until 30.1.2000.